We offer both flat rate and hourly pricing depending on the project. If you’re not sure how much your project may cost please give us a call at 678.238.0800 or contact us to send a quick message. All Flat Rate 8mm & 16mm Film Transfers include DaVinci Bestlight level/color correction and use of our Wetgate System. Minimum Order is $75 on all film transfers. QUANTITY DISCOUNT PRICING AVAILABLE! CALL OR EMAIL FOR MORE INFO! Available for the following formats: 8mm, S8mm, 16/S16mm and 35mm. All rates include use of Wetgate system and DaVinci color correction. Talk to a film transfer expert at 678.238.0800 or click the "Get A Quote" button to get started. What Kind of Film Do I Have? 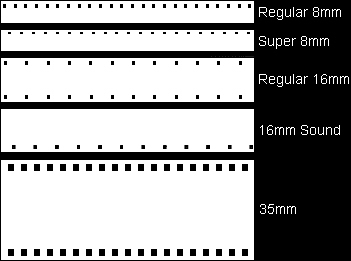 You can either measure the width of the film or compare the number of perforations (sprocket holes) with the image below.